th+a was responsible for the design of Buzz Lofts, a live/work residential building sited on an urban block near downtown Dallas. Recognized as Dallas' first Green Multifamily development by D Magazine and D HOME (awarded Best of 2006), the project incorporates 22 USGBC design points. The three-story, 49,500 SF building was the first new multifamily construction development of density in the district in at least 70 years. 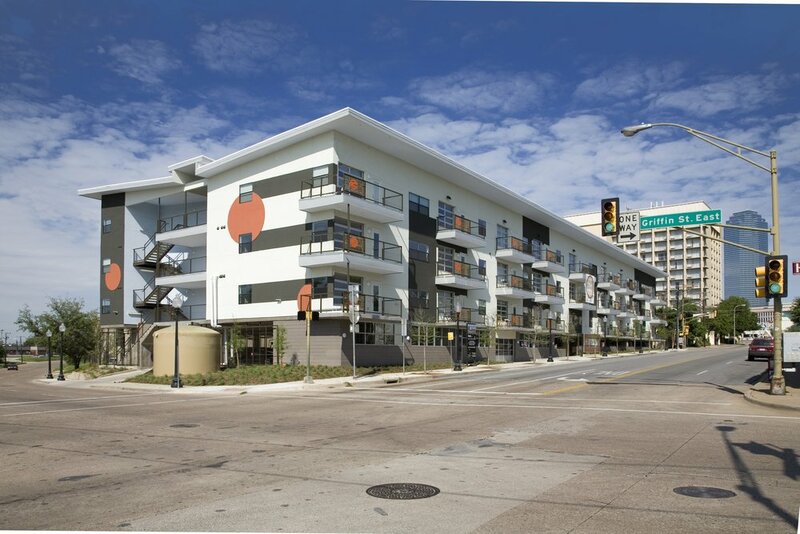 The development is a product of a larger revitalization effort as spurred by a current TIF zone, affordable housing incentive programs, a new Planned Development district, and DART rail. Sustainable, modern and artistic, the building features minimal interiors, natural ventilation, extended overhangs, water reclamation and sustainable materials. The structure's V-shaped roof cantilevers to maximize shade, while directing rainwater to irrigation cisterns. Residences open onto a shared, naturally ventilated breezeway and private balconies are accessed by operable overhead doors. Sustainable concepts include bamboo flooring, xeriscaped plantings, cementitious siding, reflective single-ply roofing and wind-powered energy. An electric scooter is provided to each unit for transportation to nearby activities.